Welcome to the new Monday edition of The Week in Bentos! Those of you who are regular readers will know that I’ve been posting my weekly bento round-ups on Fridays for years, but I’ve decided to make a change and move these posts to Mondays. My thinking was that people want ideas for packing lunches at the beginning of the week, rather than the end of the week. I hope you’ll find this change to be useful! So what did Wyatt and Augie have for lunch last week? Let’s find out! 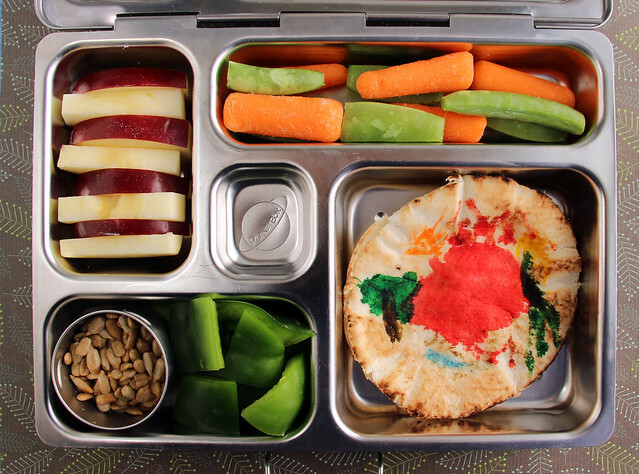 I started Wyatt, my 4th grader, off with a Yumbox lunch on Monday morning. He had a cheddar cheese stick, blueberries, white cheddar popcorn, radishes and retro ham, cream cheese and dill pickle roll-ups. My mom used to make these for the snack table when my parents had parties in the ’70’s. I spent Super Bowl Sunday cleaning out our fridge and in the process I found 5 jars of pickles. (You can probably tell I’m not a big football fan.) Apparently my husband buys a new jar of dill pickles every time he goes to the store! As I was trying to think up ways to use up our pickle stash, I remembered my mom’s pickle thingies, so I whipped up a batch to try on my fellas. Wyatt loved them, so I put them in his lunch on Monday, but it turned out he got teased for them in the cafeteria, so he didn’t eat them. 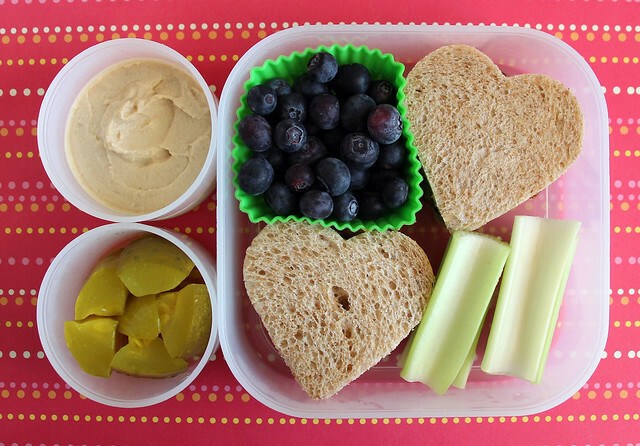 Augie had a Yubo lunch: hummus, dill pickles, blueberries in a square silicone cup , heart-shaped PB&J sandwiches and celery sticks (to dip in the hummus). 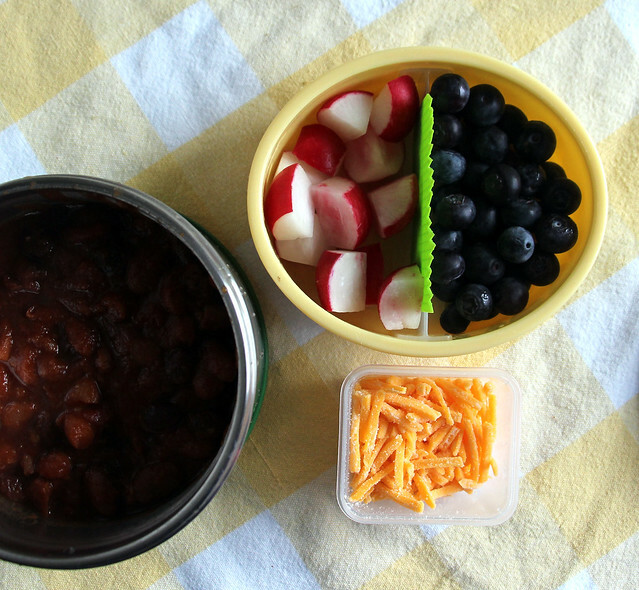 On Tuesday, Wyatt had leftover chili in our LunchBots thermal jar and a mini dipper filled with cheese to sprinkle on top. He also had a sidecar with radishes and blueberries. Augie wasn’t interested in chili leftovers, so instead he opted for turkey meatballs (from the freezer), pretzel goldfish, sugar snap peas and blue berries. There was also a small Snoopy cup filled with ketchup for dipping the meatballs. This was packed in our CuteZcute Penguin Baby Bento Buddies box , which is much cuter on the outside than you can tell from this photo. Wyatt had chili again on Wednesday, in the same LunchBots thermal jar. 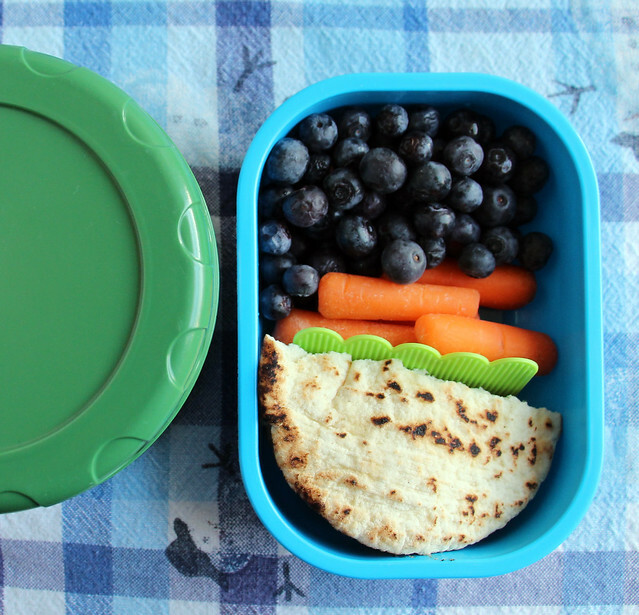 I packed him a small bento with blueberries, carrots and mini pitas to go with it. Augie was enthusiastic about helping to pack his lunch so I let him dive right in. He decided he wanted to use the PlanetBox Rover, then he selected apples, carrots, snap peas and green bell peppers to go in it. I filled up a small container of sunflower seeds for a crunchy treat and filled the big section of the box with a mini pita that I split in two and spread with a layer of hummus. When Augie saw the blank slate of the pita, he asked if he could draw a picture on it with food-safe markers . The red in the middle is an erupting volcano, and there is a tree on one side and a dinosaur on the other. 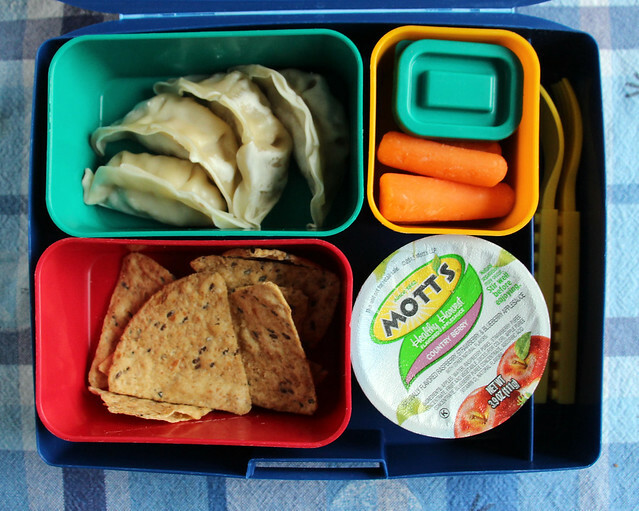 On Thursday, Wyatt had dumplings, carrots with bean dip, a tub of applesauce, and multi-grain tortilla chips. 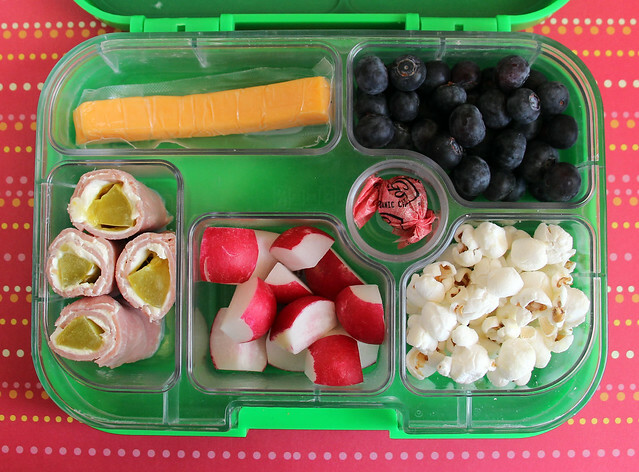 This was packed in our Laptop Lunches box and I threw in a set of Lego utensils to eat with. 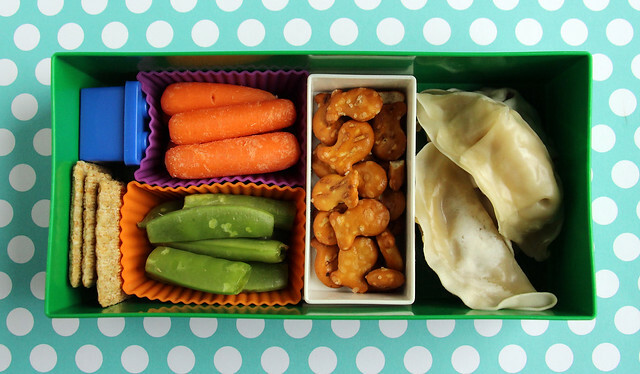 Augie chose the Lego bento box for his lunch: a small Lego container with hummus, a few crackers, carrots and snap peas in rectangular silicone cups , another Lego box filled with pretzel goldfish and chicken dumplings. Friday, I broke out the new Star Wars stuff I bought on sale from Williams-Sonoma! 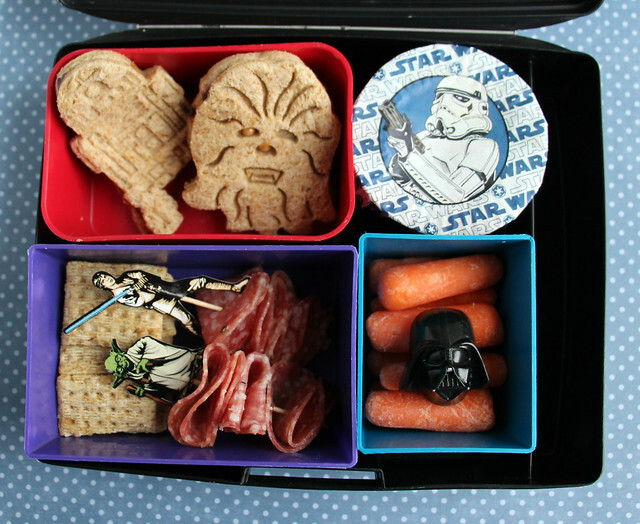 Wyatt doesn’t let me make cute lunches for him very often, so I was happy when he gave a thumbs up to a Star Wars lunch. I was particularly excited to break into the Rebel Alliance cupcake set, so I pulled that out, along with my other Star Wars toys and went to town. To start, I made jam sandwiches with our C3PO and R2-D2 cutters. (These are from a set that’s been discontinued, unfortunately. You can still find them on eBay for crazy, rip-off prices sometimes though.) I also added carrots with a Darth Vader ring, Triscuits, salami on Luke Skywalker and Han Solo picks and an applesauce tub, covered with a Chewbacca cupcake wrapper. I was particularly pleased with the cupcake wrapper because I normally can’t think of anything fun to do with those. This lunch was packed in a Laptop Lunches box. 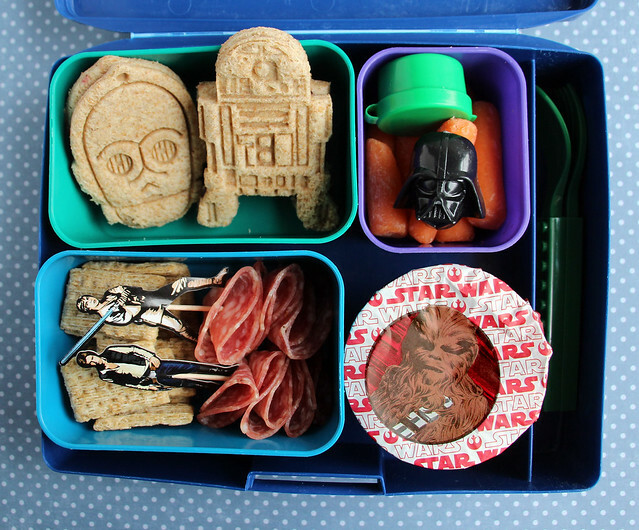 Augie had a nearly identical lunch, also packed in a Laptop Lunches box: R2-D2 and Chewbacca PB&J’s, crackers and Luke and Yoda salami skewers on one side. And over on the Dark Side he had an applesauce cup wrapped with a Stormtrooper cupcake wrapper and carrots with a Darth Vader ring. Happily, both boys loved these lunches. Hooray! 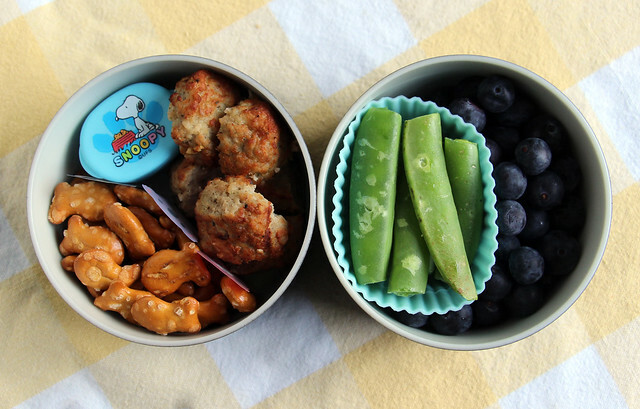 Hey, did you know my book, Everyday Bento: 50 Cute and Yummy Lunches to Go will be released in just a few weeks? It officially goes on sale March 4, but it is available for pre-order now from Amazon , Barnes & Noble and Powell’s. If you are interested in entering a giveaway for one of FIVE copies, head on over to Goodreads to enter before the end of the month!